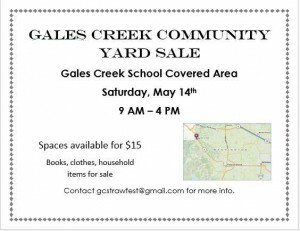 For the third year in a row, the Gales Creek Chamber of Commerce will host the Gales Creek Community Yard Sale on May 14th at the Gales Creek Elementary School covered area. The sale will run from 9 am to 4 pm, and will include many local families selling various household goods, clothing, electronics, tools, books, and much more. 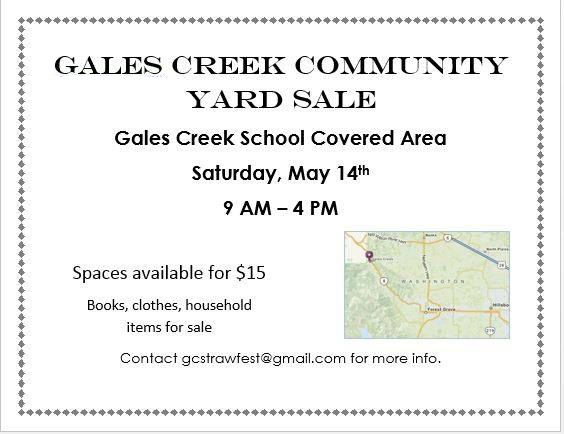 There are still 8 out of 20 spaces available for those wishing to sell at the yard sale. Each space is $15 and comes with a table. Those wishing to rent a space should contact us at 503-395-8131 or gcstrawfest@gmail.com.